Your Cleared for Flight Instructing course is a ground school and flight training prep course rolled into one. This is your interactive online video course for becoming a flight instructor complete with course syllabus. You'll learn all the subject areas you need to become a knowledgeable and confident flight instructor. You'll pass the FAA CFI exams with ease as you'll be up-to-date with the most current information the FAA wants you to know. In addition to advanced concepts of aerodynamics, your CFI preparation will focus on teaching maneuvers and the fundamentals of instruction (FOI)—to prepare you to convey information to your students logically and effectively. With KING in your cockpit, before you know it, your first student will be soloing! Through intimate video instruction, you’ll learn directly from John and Martha King. Their clear, simple and fun teaching has made aviation learning accessible to hundreds of thousands of pilots world-wide. You’ll remember their vivid and often humorous presentations as long as you fly. Pilots have frequently told us that as they faced critical situations in the air, the Kings' words replayed in their minds right when they needed them. You will always consider John and Martha your personal aviation mentors. Question Review Ensures Your Success! Once you have completed all of your lessons, ensure a top score by using KING's exclusive built-in test prep with FAA-style questions. You can even filter review questions by ones previously unanswered, marked or missed. Use each question’s detailed explanation to refine your knowledge and see your progress through intuitive reports. Then, check your test-readiness at any time by taking unlimited randomly generated practice exams and you will know when you are ready to ace your exam! 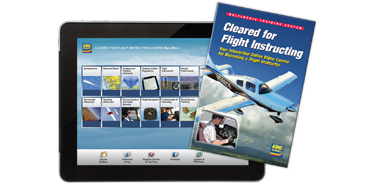 The FAA frequently updates the required knowledge for each test. King Schools continuously updates all courses, ensuring you get the most current instruction available anywhere. Your online course includes a FREE iPad and iPhone companion app that connects to your mobile device and allows you to download the course's video lessons so that they can be watched at any time, with or without Internet connection. It requires you to have a King Schools iLearn account containing at least one KING online course. Search 'King Schools' in the App Store for complete information and to download this free King Schools Companion app. This course is a part of the Cessna Flight Training System. It works best if you are training at a Cessna Pilot Center and you flight instructor is using the included course syllabus. It will prepare you for your FAA CFI knowledge test and also includes video demonstrations of each CFI flight maneuver, allowing you to show up fully prepared for your lessons. Online course media requires a PC or Mac computer with a broadband Internet connection. Your course is compatible with the web browser on your Apple or Android device. In addition, the free King Schools Companion app allows you to view your online course(s) on an iPad or iPhone when not connected to the Internet. The free app is available through the iTunes App Store by searching for "King Schools Companion." KING courses are up-to date with the latest information and subjects areas the FAA wants you to know. KING online courses contain FAA-style questions which are representative of all the subject areas the FAA tests. Warning: You can’t just memorize test questions and expect to pass your FAA CFI Written Test. Why? The FAA used to make their test question banks publicly available; however, they have not done so for many years. In fact, the FAA has recently gone through their entire database and changed every single test question and answer in order to eliminate test question memorization. No one, including test prep educators, has access to the FAA question banks. To be a safe and competent pilot-in-command, and to pass your required tests, there is no shortcut. You must acquire the necessary pilot knowledge. Online Course Media - Your online course is always up-to-date as the course is automatically updated whenever changes occur. Is there a particular order to follow? Are some lessons easier than others? Just follow the phases from start to finish; it´s that easy. Of course you can skip around if you chose but we recommend doing the phases in order. How much time will it take to complete the course? The course contains over 14 hours of video instruction. King Schools courses are self-paced so completion time for each course will vary from person to person. What if I have a question? Is there a CFI available? If you still have a question about your course, you can call us during our normal business hours at 800-854-1001 or +1 858 541-2200. You can also email us at custserv@kingschools.com - We have a full staff of pilots and flight instructors available to answer your questions. Please be aware that it may take 24-48 hours to respond to an email so please call us if you need immediate attention. Of course, when you take a King Schools course, it is like having a flight instructor with you 24 hours a day, seven days a week. You can review the material as often as you like at any time. Sometimes, you may want to review a video segment a couple of times. How do I access my course completion certificate? Once you have completed all the lessons and answered all the questions in each lesson, you´ll be able to print out your completion certificate. Can I still access the course material after I complete the course? You have lifetime access to your courses. Remember, with the online media, the course is also automatically updated and will always be current. The videos are organized and well put together. The videos are organized and well put together. This is a good tool for flight instructor training. The website could use a facelift. The layout and functionality is fine, but you can tell it was created 10 years or more ago. Still highly recommend it! Very thorough, well organized, great preparation. Enjoyed the quality of videos and the way the material was presented in a logical order. I have used King schools for refresher training and upgrading my certificate over the years. I appreciate being able to review all the questions to ensure I understand the answers. I enjoy being able to progress at my own pace, as well as the ability to go back and review sections in which I need additional instruction. I love the way the King's teach. While I like the video breakdown and explanation of the questions, I do believe they need to be updated in order to grab the viewers attention. I found the content a bit dry and hard to focus especially when other products are out there to help you prepare for the written exam and at a lower price point. The FOI notes though and the other tools provided are very nice. A solid course as always! A solid course as always! Thank you King Schools! This is the third course from King that I have completed, all have been well made. Not only does the app work well, or using the online site, but there is a lot of great info from the course. It is not just information to help with the written test for each certificate or rating, the videos cover much more than just that! I enjoyed the course and of course, learned a lot. The course is designed to be at your own pace, as fast or slow as you need. The material was great, did a great job covering the subject areas and the FOI stuff was great, saved me from having to comb thru the Instructors handbook. Test prep material was good, scored an 84% on my FOI exam and an 81% on my CFI, plan on using it for the AGI. Would buy this again. This CFI Course was very user friendly and convenient to use along side my CFI training. My instructor was able to see my progress and performance. There's a lot of important information to take in and retain from this course. I think the course did a great job in giving that information and it was nice to have a program that was easy enough to navigate and get back to specific lessons for review.